Now I have spoken before about my love, for those vintage Melmac confetti mixing bowls. 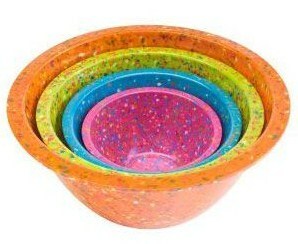 Currently ZAKS is making this amazing set of bowls in these wonderful fun colors. I am still in love with that orange bowl. But what I really wanted, was a set of vintage confetti bowls. So for months... I have been stalking and bidding on different sets. Watching them sell... for lets be real... scary money. I wanted a really great set of Melmac mixing bowls, in a great color pattern. Like these confetti bowls, that I stalked around after in eBay back in 2013. And the goal was to obtain a three bowl set. Oh my... what is in that wad of paper??? They are turquoise! A gorgeous blend of turquoise, pink and yellow speckles. I could not be any more pleased! Let me show you the original listing pictures... which were lovely. I really thought they were a nice soft turquoise color... on this set of bowls. And would look really cute mixed in with all the pink kitchen wares I own. But when I got them unloaded from the box... I realize they were actually a lot bolder in color, in person. Woo hoo! These are just so dang pretty. So I pulled down my vintage Mason jar and my favorite turquoise utensils for a quick picture. I still have too much flash on these images... but look how pretty they are! I am so happy for you! Isn't it fun when we acquire a treasure that makes our heart sing?! I'm celebrating with you! Confetti bowls are my newest obsession! I have been fortunate to find them for super cheap at flea markets and garage sales the year. But no pink or turquoise. Yet! Those are great! I love the color of them - I have 2 sets of ZAKS bowl sets that I got at a yard sale for $2 each set............a new bride got them as wedding presents and hated them. I love mine except I accidentally dropped my green one and it hit on a weak spot or something - whatever the reason it shattered into a million pieces................Just love yours though! I have looked at the ZAKS set. I would not have ever guessed that they would shatter! But your probably correct... it just happen to hit the one spot, that promptly caused it to shattered. I still love that big crazy ZAK orange confetti bowl. If I could find a full set in orange. I would break down and purchase them. I really did stalk around eBay for months, looking for a set of 3 matching bowls. I am still looking through the new listings. Hoping that I might get lucky with a set of pink ones.